Days after ditching his army fatigues to run for president, former army chief Abdel Fattah El-Sisi has made his first public outing in some out-of-the-ordinary civilian attire. Photos of the 59-year-old – who resigned as Egypt's army chief and defence minister last week to announce his intention to run for president – riding a bike, began circulating on social media on Sunday evening. 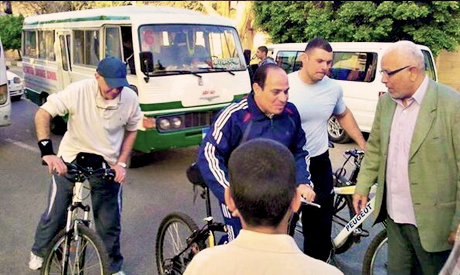 In one of the photos, reportedly snapped in Cairo, he appears wearing a navy tracksuit alongside two others cyclists – also in sports gear – with a bus and a microbus in the background. In other photos, El-Sisi stops to chat with passersby. Facebook and other social networking sites were bristling with comments both mocking and praising the images. "The first president in the world to ride a bicycle and go among the public... because he knows everybody loves him," wrote one Facebook commenter. El-Sisi has become a cult figure since he led the ouster of Islamist president Mohamed Morsi in mid-2013 following millions-strong protests against his troubled year in power. He has been idolised by his supporters as the country's saviour and hailed by many as the only person capable of restoring order after more than three years of political turmoil since the 2011 uprising. Many Twitter users shared screenshots showing the price of a Peugeot bicycle – the same brand as El-Sisi was riding – from the French firm's website. "The bike's price turns out to be LE40,000 [roughly €4,000] and he is asking us for austerity," wrote one Twitter user, alluding to an address El-Sisi gave earlier in March asking Egyptians to tighten the belts to help rescue the country's ailing economy. Peugeot bikes can fetch €300-4000, according to the website. Fervent supporters of the former army chief were quick to defend him. "Go Sisi go! You make them [your opponents] jealous," Another wrote. "The Field Marshal is riding Egypt's production 'wheel'... We love you Sisi," a third commented. TV host Ahmed Moussa claimed El-Sisi went cycling alongside a private guard "without notifying any security authority," likening him to European leaders and contrasting this to the large processions "used to guard former president Morsi." Others doubted the authenticity of the ride: "Which military camp was he snapped in? And from where did he get the extras? Honestly, I'm not convinced," said Ahmed Nagy, a 39 year-old taxi driver. 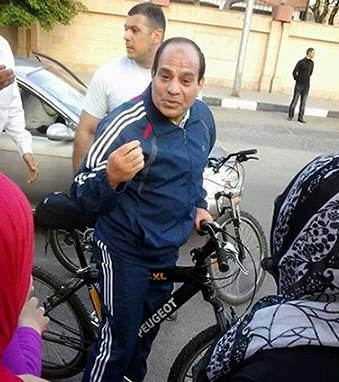 But cycling appears to be one of El-Sisi's hobbies. The Washington Post reported last week that "a high-ranking military officer close to El-Sisi said the general often rides his bicycle around the defence ministry’s vast compound." Last week, El-Sisi declared his much-anticipated candidacy in a presidential poll which he is tipped to win by a landslide. Egyptians will vote in the first round on 26-27 May, the country's electoral committee announced on Sunday. In a country with so much civil unrest why is this the headline two days in a row - can someone explain this to me? I am not convincened that it is a genuine interest because You can see Alsisy and his bodyguards are cycling in the wrong direction. No helmets or High visionable vest as if Egyptian streets are very safe or even better than strrets of western cities. Well done Mr Sisi. I respect any politician who doesn't need to go everywhere with a big motorcade. 25 years ago I made sure to have my back to a motorcade of Mubarak when his ego needed a major road (Rhamsees St) blocked to everybody for an hour. Cycling would solve the unbearable traffic problems in over crowded Egyptian towns. I hope El-Sisi' love for bicycles will lead the government to do something to make it possible to use bikes in Egypt. Now it's much too dangerous. I wish Egypt a fast recovery back to a tolerant society, respecting the human rights. Fantastic, just give the men credit of trying, but no there are some idiots who can't shut up about a Peugot bike, it's second hand from eBay, you idiots, 150 euro, I put it there myself. Well done Mr. El Sisi, ignore all those stupid comments.